What Is DA Form 2166-9-1A? DA Form 2166-9-1A, NCOER Support Form is a support form that is used for gathering information during the evaluation of U.S. Army Non-commissioned officers (NCOs) in the rank of Sergeant (SGT). This form is a part of the DA 2166-9 series that contains five other rank-specific performance assessment reports. The latest version of the form - sometimes mistakenly referred to as the DD Form 2166-9-1A - was issued in November 2015 by the Department of the Army (DA). An up-to-date fillable DA Form 2166-9-1A is available for download below or can be found on the Army Publications Directorate website. The SGT NCO being evaluated should receive counseling from a senior rater at least twice during the rating period. Having received counseling, the NCO needs to fill out the form providing a self-assessment of their work goals and expectations, along with a personal evaluation or their professionalism, performance, attributes, and competencies. A senior rater can provide additional comments to the self-evaluation, if necessary. the proponent agency is DCS, G-1. i. SSD AND NCOES REQUIREMENT MET FOR NEXT GRADE OR NOMINATIVE/JOINT ASSIGNMENT? beginning of the rating period. description and objectives with the organization's mission, problems, priorities, and similar matters. If the rated Soldier is recently assigned to the organization, the rater may use the counseling to outline a duty description and performance objectives. This discussion gives the rated Soldier a guide for performance while learning new duties and responsibilities in the unit of assignment. and performance objectives for the rated Soldier. assess developmental progress. Summary or key comments will be recorded for inclusion when preparing final NCOERs. Ensure support forms (or equivalent) are provided to all rated Soldiers they senior rate at the beginning of and throughout the respective rating periods. information provided on the rated Soldier's support form. Soldier and the rater at the earliest opportunity. Establishing a workplace and overall command climate that fosters dignity and respect for all members of the unit. (4) This assessment must identify any failures by the rated Soldier to foster a climate of dignity and respect and adhere to the SHARP Program. feelings and emotions. The desire to care for and take care of Soldiers and others. organizational, training, and operational duties. Military and professional bearing - Possessing a commanding presence. Projecting a professional image of authority. Fitness - Having sound health, strength, and endurance that support one's emotional health and conceptual abilities under prolonged stress. through control over one's emotions. An Army leader`s intellect draws on the mental tendencies and resources that shape conceptual abilities applied to one`s duties and responsibilities. are both novel and appropriate. displaying self-control, balance, and stability. Expertise - Possessing facts, beliefs, logical assumptions and understanding in relevant areas. accomplishment. Direct leaders influence others person-to-person, such as a team leader who instructs, encourages hard work and recognizes achievement. and grows from common experiences and shared understanding. arbitration, partnering, conflict resolution, consensus building, and coordination. demonstration of commitment and action. into actions. Communication is essential to all other leadership competencies. better than it was when they arrived. leadership roles and their profession. loss of effectiveness as far into the future as possible. supervising, managing, monitoring, and controlling the work. The DA Form 2166-9-1A is regulated by the Army Pamphlet 623-3 (Evaluation Reporting System) released in November 2015. 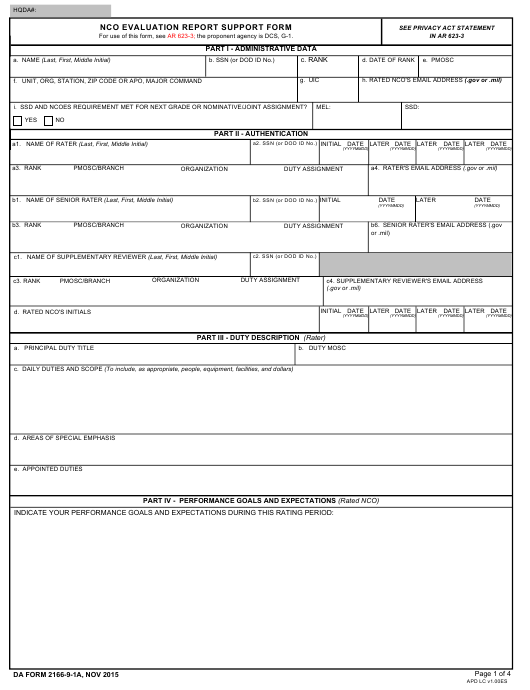 The form consists of four sections: administrative data, authentication, a duty description (filled out by the rater) and a review of performance goals and expectations (filled out by the Non-commissioned officer being evaluated). The evaluated NCO is required to provide some of their personal information in the first part of the form. This includes their name, social security number, rank, email address, and information on their unit. It is also necessary to state whether all Structured Self Development (SSD) and Noncommissioned Officer Education System (NCOES) requirements were met for the next grade or nominative assignment (thus showing potential for promotion). The second part of the form should provide identifying information on the rater and senior rater who will be performing the assessment of the NCO's performance and professionalism. This part requires the raters' names, social security numbers, and email addresses. Both raters must provide information on their rank, branch, duty, and organization. Both raters must sign and date the document in the appropriate columns. The third part of the DA 2166-9-1A - Duty Description - should be filled out by the rater. The last part is to be completed by the NCO - they are required to describe their expectations and goals for the upcoming evaluation period. DA Form 2166-9-3, NCO Evaluation Report, CSM/SGM.